On its daily chart, the USD/CAD Forex pair is trading inside a rough ascending channel since December 11, 2012. The upper side of the channel is not fully defined (only two price spikes touching it), while the lower border has been broken on February 7. Although there is no significant downtrend prior to this channel, a bearish breakout should be expected as the pattern usually signals a continuation of the previous trend. The borders are showing with the yellow dashed lines. They are encased in the cyan lines, which are marking entry levels for the pending stop orders and are positioned at 10% of channel’s height above and below the borders. 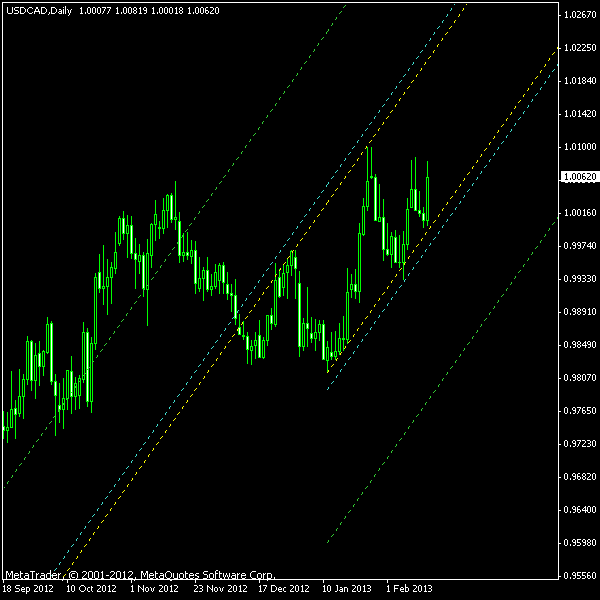 Take-profit levels are marked with the green lines positioned at 100% of channel’s height above the borders. I will use the breakout’s bar low/high for a stop-loss in case of a bullish/bearish breakout. You can download my MetaTrader 4 chart template for this USD/CAD pattern. By the way, this channel will also be the first pattern that I will trade using the expert advisor in my live account. It is an experimental EA that was created to trade such set-ups with as little manual intervention as possible. Stay tuned as it will soon be available for a free download among other MetaTrader expert advisors on EarnForex.com. Update 2013-02-26 15:32 GMT: The rally broke through the upper border of the channel and triggered the long position entry at 1.0285 exactly 15 minutes ago. Stop-loss is set to 1.0221 and take-profit — at 1.0478. Since this bullish breakout may actually be the end of a rather strong and long-lasting rally, increasing the take-profit level according to its inclined line is probably not as good idea as usually. Nevertheless, I will follow my own rules and continue to raise TP every trading day. Update 2013-02-28 7:50 GMT: Hit stop-loss at 1.0221 just 8 minutes ago. As I have said, upper breakouts of descending channels can be treacherous. If you have any questions or comments regarding this ascending channel on USD/CAD chart, please feel free to post them via the form below. Am impressed and thankful for the vast amount of resources you make available here. A question regarding your channel lines: How do you draw the second set (at 10%) and third set (at 100%) with accuracy? I use calculator to calculate the values and then set them via channel properties – I do not drag those lines with mouse. BTW. Is there a downward channel forming on EURJPY at the moment? It can go up inside the the channel for quite a long time before breaking to the downside. Daily chart. It looks like downward channel or flag-a-like pattern. I trade mostly breakouts so I am not good at spotting chart patterns. 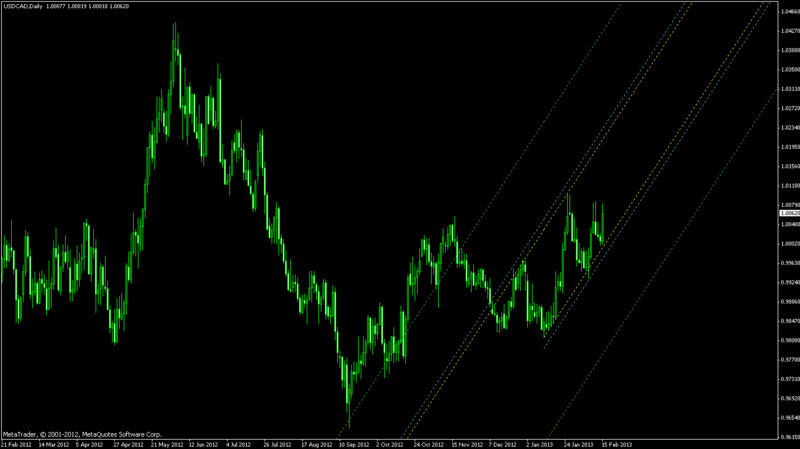 Yes, there is a sort of descending channel, which is more visible on H4. Pretty rough though. Will post about it on Sunday if it holds.